How Can I Go Philadelphia Bikesmith? Where is Philadelphia Bikesmith in Philadelphia on the Map? Great service done fast and cheap. I'd never take my bike anywhere else and if I need to buy one, this will be the place. On top of all that, totally awesome atmosphere. If they served beer here, I'd probably visit just to hang out. Great crew, great bikes. Everyone was really well informed and helpful. There is great value to having a fitting for a new bike and they definitely know what they are doing. Also, their wrenches are unmatched. Philadelphia Bikesmith is a one stop shop for casual bikers, commuters, competitive cyclists, and triathletes looking to up at least one of their three events. 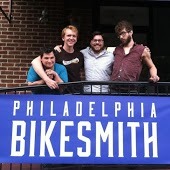 Aside from stocking all you can need for your biking, Philadelphia Bikesmith offers the BEST service in town. The staff will never try to "upsell" you unless that higher end product is actually what you needed. The staff will make sure that you are helped immediately and, if very busy, they will at least acknowledge you and ask if you can hang tight for a bit. Most importantly, if you do not know much about bikes and have a problem, the staff will never treat you dumb for not knowing what's going on; contrarily, they take the time to explain it to you and teach you how to avoid/manage such problems. Do the right thing for yourself, go to this shop. Such great fun people. My bike was stolen and they really hooked me up well with a new bike plus gear. Richie is amazing. :D He made sure I new how to lock up my bike better. Give him all the hugs and money. The greatest bike shop I've ever been to. Incredibly knowledgeable, not condescending, and just really enthusiastic about bikes and helping people. Every cyclist from commuters to cyclocross racers, roadies, triathletes, mountain bikers, and beyond will benefit from paying this shop a visit. They carry Giant, Kona, Norco, and Parlee (and maybe a few others), but the best product is the service.